POLYMAGICTM is a special, patented technology that incorporates LEDs, light sources, or electronic materials into glass panels to create distinctive patterns, images, and logos. It serves as an excellent promotional tool in creating attention-getting displays. 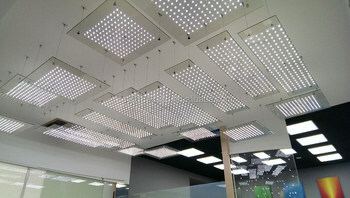 High-performing LEDs conserve energy while being very bright. POLYMAGICTM is available in special flat or curved glass with LEDs to match your applications without any distracting wires. With POLYMAGICTM Glass, you will find innovative ways to use your imagination! This product helps to provide creative designs for architects and other innovative users. Some application examples are lights, bathrooms/shower enclosures, clinics, conference rooms, tables/benches, hurricane resistant exterior window displays, inner doors, shop windows, façades, residential effects, shelf displays, skylights, boutiques/specialty counter displays, as enhancements to specialty items like clocks or novelty displays, 3C products, and more.